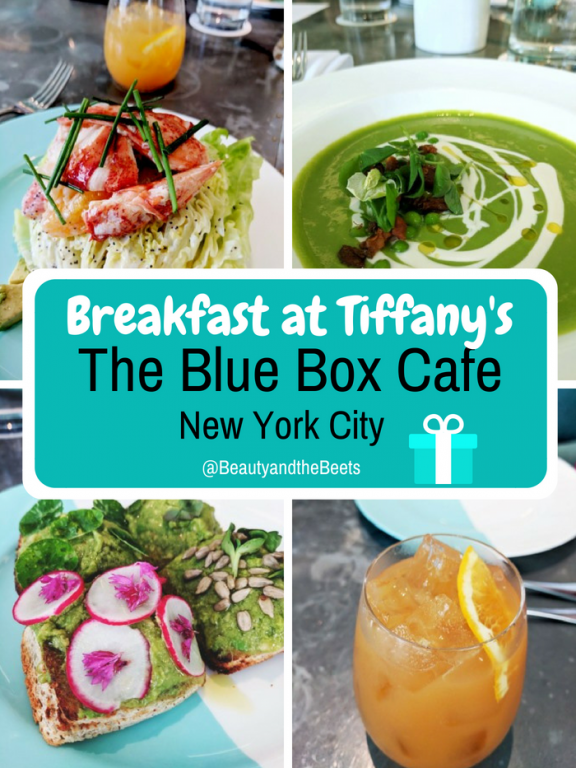 I had Breakfast at Tiffany’s – The Blue Box Cafe in New York City. 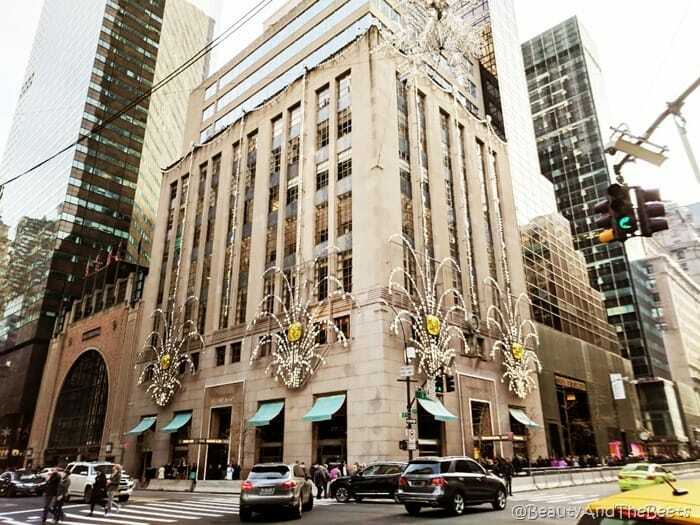 When the movie “Breakfast at Tiffany’s” was released in 1961, millions of people have dreamed about actually having breakfast at the iconic Fifth Avenue store in New York City. Now, 56 years later, that dream can now be a reality. 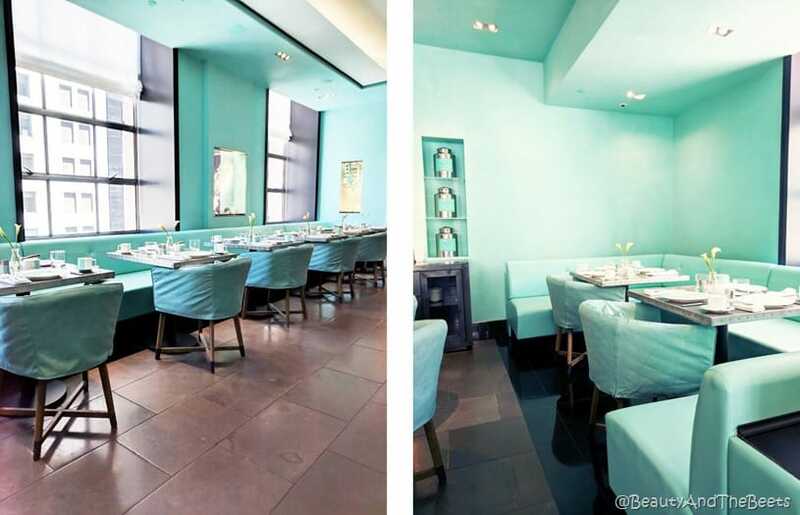 Last Fall, The Blue Box Cafe opened on the fourth floor inside the Tiffany & Co. store, made famous by the film. We entered the store and walked past the cases of beautiful platinum engagement rings and pearl chokers towards the elevators. (By the way, I did not find any $10 sterling silver telephone dialers as seen in the movie). The newly redesigned fourth floor houses the home and accessories department as well as The Blue Box Cafe. The cafe is very small, holding only about 15 tables. 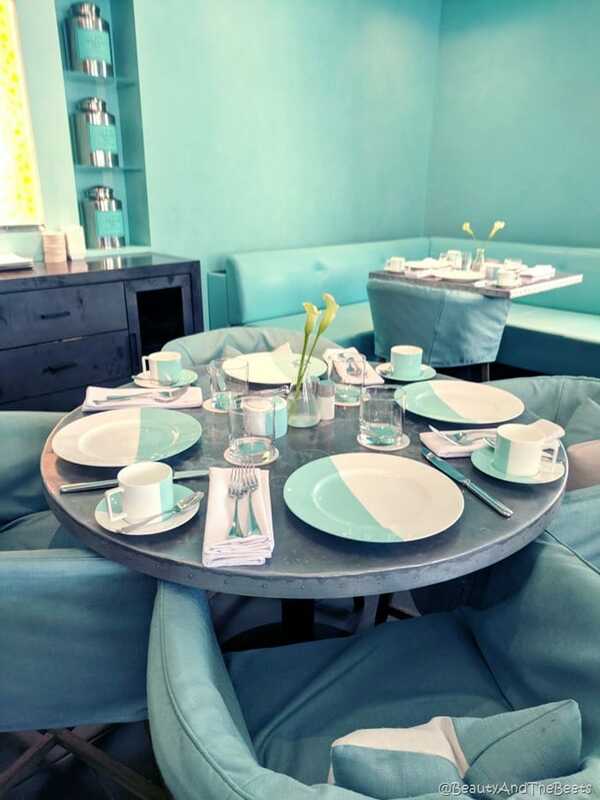 The room is decorated in the signature Tiffany blue color with white accents from, the tablecloths to the walls to the tableware. The menu is not very big, a handful of items for breakfast and lunch, both of which are available at any time the cafe is open. My tablemates and I were split, ordering both breakfast and lunch among us. 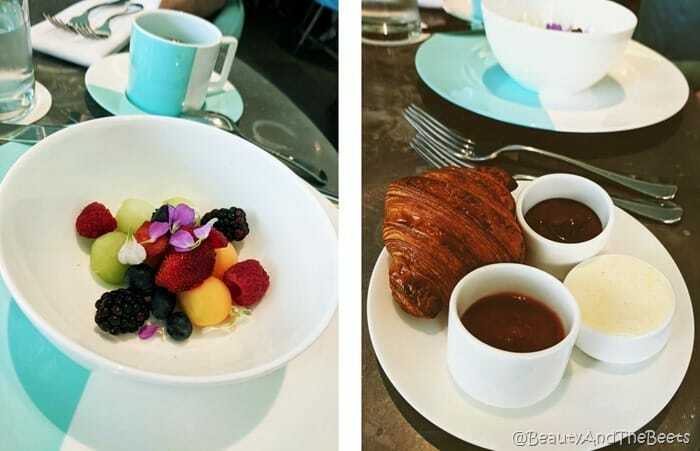 The breakfast starts with a bowl of fresh fruit and berries, as well as a mini croissant with nutella, honey butter, and fruit preserves. From there you get a choice of a smoked salmon bagel, a buttermilk waffle, avocado toast, or a coddled egg. My Mother chose the avocado toast. 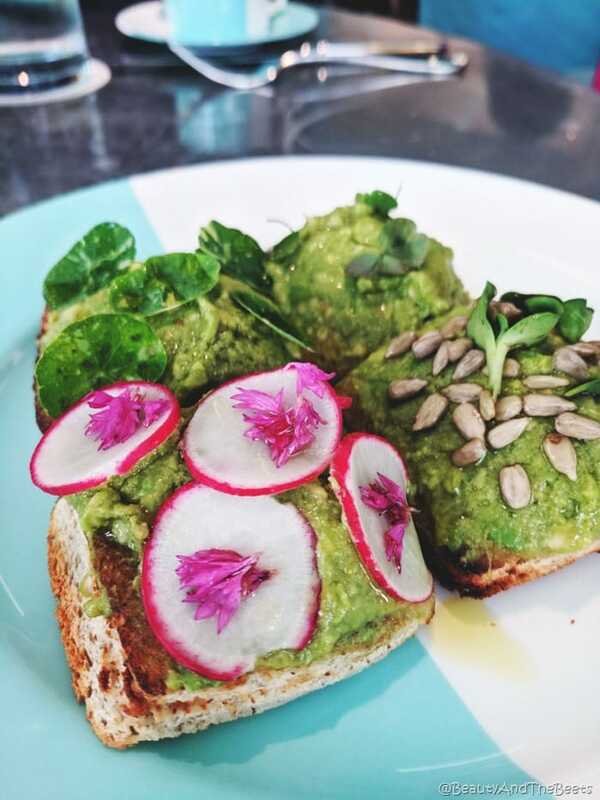 Four slices of thick toasted bread mashed with fresh avocado topped with sunflower seeds, nasturtium (a flowering plant), radish, and sorrel (an herb). Lunch included a selection of appetizers including chilled pea soup, komkachi tartare (fish), burrata, or a fruit endive salad. I chose the pea soup. It was simple with crème fraiche, smoked bacon, and fresh mint. The mint was subtle and the texture was thick and creamy. 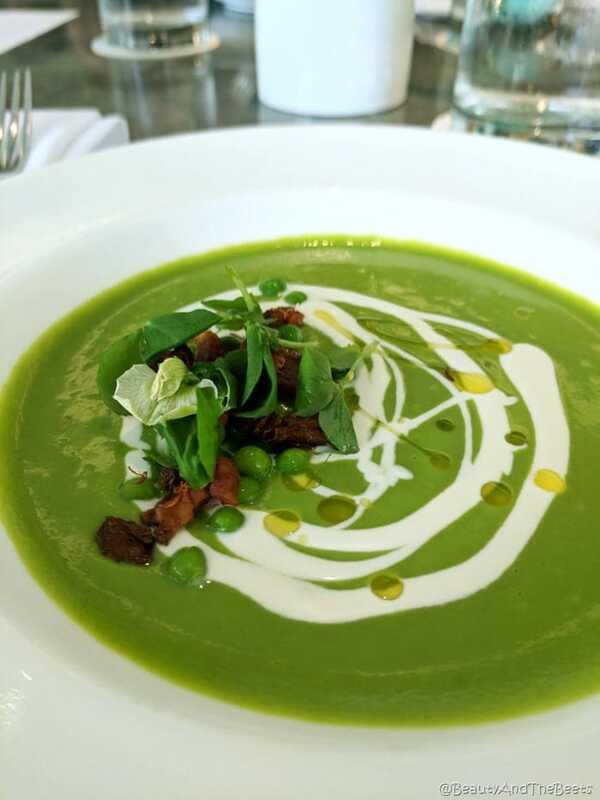 I found it to be perhaps the most refreshing soup I have ever enjoyed. But I am also a sucker for chilled anything in the summertime when the temperature is above 90°. 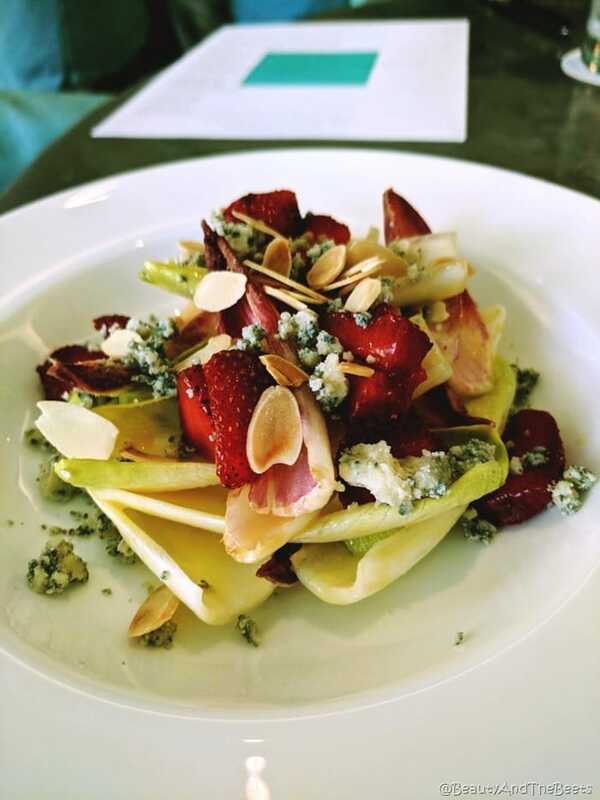 Mr. Beet tried the Belgian Endive with strawberries, toasted almonds, blue cheese, and citrus vinaigrette. I would have been incredibly happy with the chilled pea soup and the endive salad as my meal, but there was more. Lunch entree choices include the “Charles Lewis Tiffany” CLT Club Sandwich (chicken salad), pork flatbread, baby beets salad, lobster salad, or olive oil poached halibut. I ordered the Fifth Avenue Salad which the server told me is one of the most popular meals served at The Blue Box Cafe. 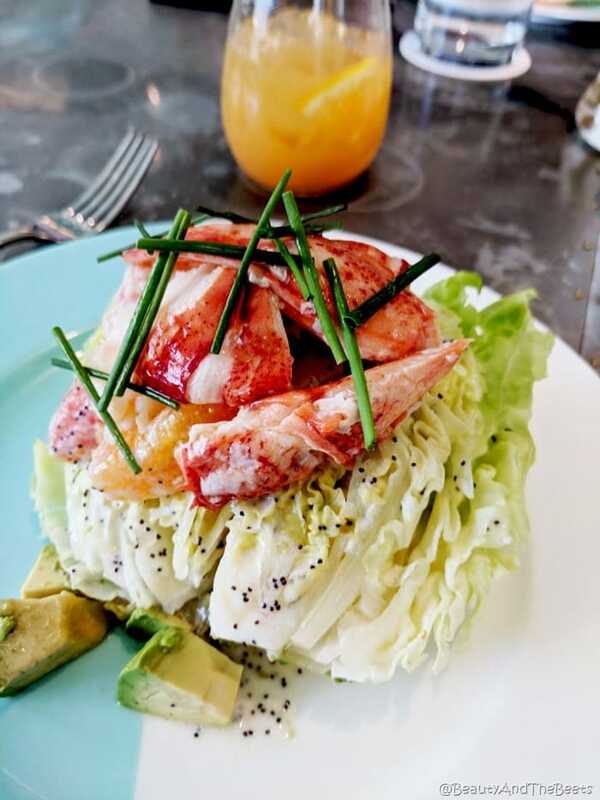 How can you go wrong with the combination of Maine lobster, avocado, and fresh grapefruit topped with a light poppy seed dressing? Absolutely amazing. You can put lobster and grapefruit on a doorknob and I would love it. The lobster meat was quite fresh and meaty. 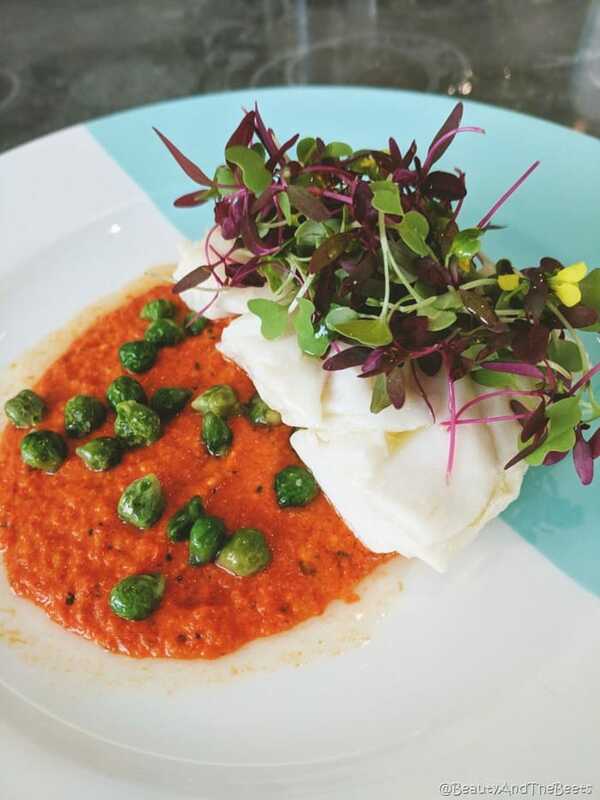 Mr. Beet tried the Olive Oil Poached Halibut with a slightly spicy Spanish Romesco sauce, amaranth grain, and green chickpeas. Again, the halibut was fresh and cooked just right. 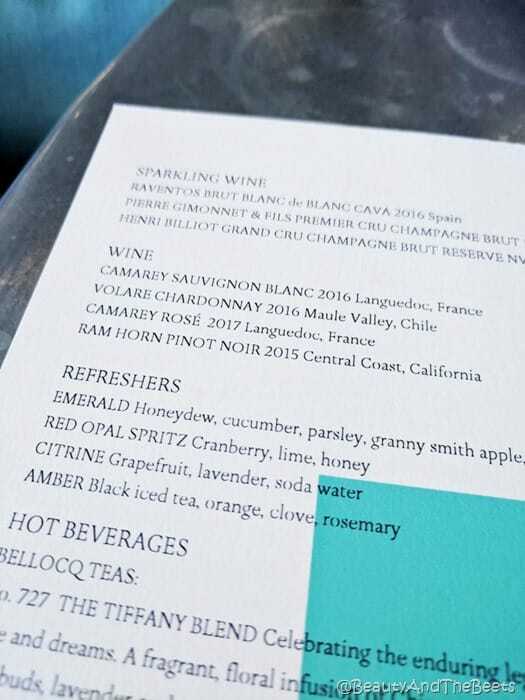 The Blue Box Cafe also serves a selection of wine, teas, and non alcoholic refreshers. 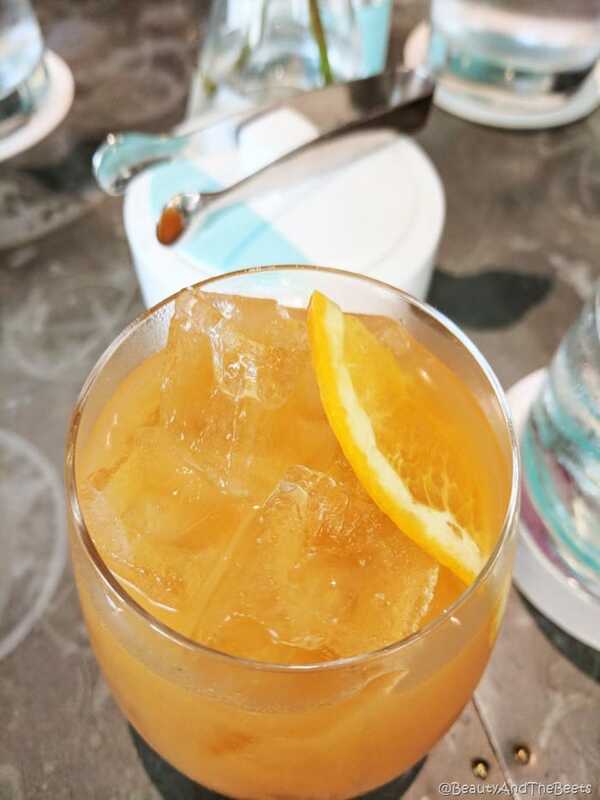 I enjoyed the Amber black iced tea with oranges, cloves, and fresh rosemary. Overall, I had a great experience. Keep in mind The Blue Box Cafe requires reservations – you will be turned away if you just show up for a table so don’t even bother. Reservations are only available on the RESY app. Click to learn how to score Blue Box Cafe reservations. 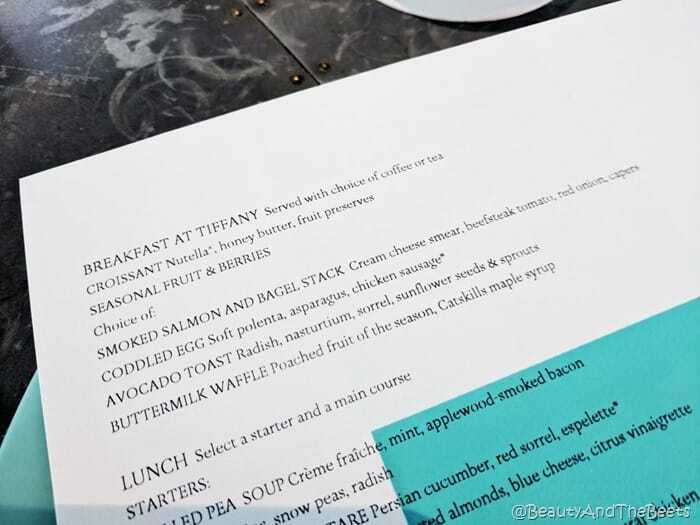 I am looking forward to recreating some of these dishes at home to relive my Breakfast at Tiffany’s experience. Be sure to sign up for the Beauty and the Beets newsletter to be in the know when these recipes post. Click here to sign up. For more information visit The Blue Box Cafe website. Great write-up. It is a great experience and very good food. What an amazing experience! 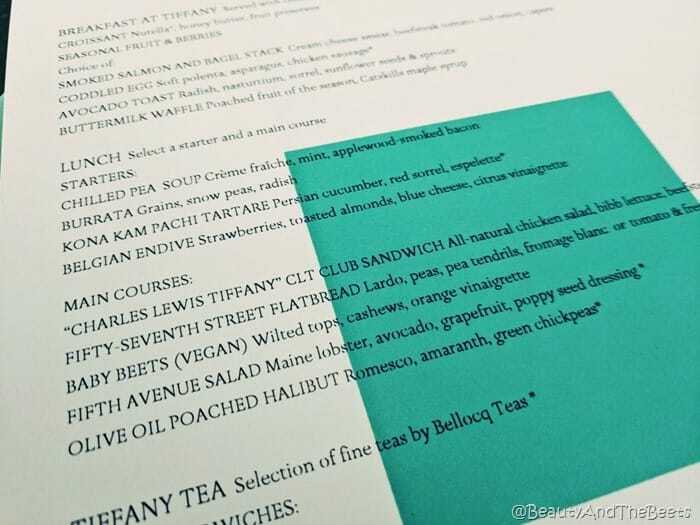 As a huge Audrey Hepburn fan, I will definitely have to try the Blue Box Café next time I’m in New York. Great post!